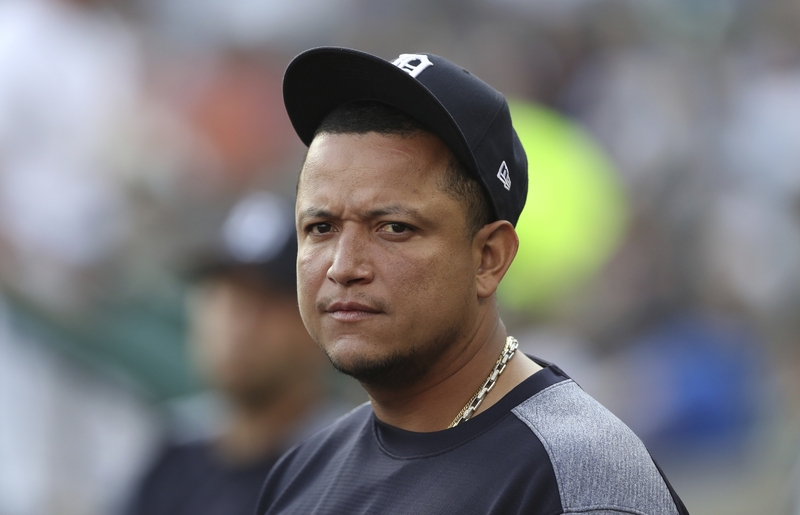 DETROIT (AP) — Miguel Cabrera can now say it with a good deal of certainty: Baseball is harder than it looks on TV. It’s not nearly as simple on the field, of course, and right now all Cabrera can do is watch. The Tigers lost their star first baseman in the middle of June to a ruptured biceps tendon, and he’s out for the season. Detroit was in a rebuilding mode anyway, but losing one of the team’s top hitters was a significant blow. Cabrera was back at Comerica Park on Monday night to host an event supporting children’s health and youth baseball programs. He seemed to be feeling good, but he has a long way to go before playing again. Cabrera said he goes back and forth between Michigan and Florida, and he thinks he’s making good progress toward being ready for spring training next year. The two-time American League MVP is 35 now, and this was supposed to be a crucial year for the veteran to show if he could still be one of the game’s most feared hitters after a poor showing in 2017. Instead, Cabrera has played only 38 games after never playing fewer than 119 in his previous decade with the Tigers. Cabrera’s big contract extends through at least 2023, which means Detroit may have a hard time trading him as part of its rebuild. In 2016, he hit .316 with 38 home runs and 108 RBIs — his eighth straight year finishing in the AL’s top seven in batting average. Then last season, he hit .249 with only 16 homers and an unsightly .399 slugging percentage. There were some decent signs early this year. Cabrera hit .299 with a .395 on-base percentage. But he had only three home runs. He was hitting .323 when he went on the disabled list in early May with a hamstring strain . He came back June 1, but his bat was quiet from then until his season-ending injury June 12. Cabrera’s absence has left a big hole in the lineup, and Detroit has backup catcher John Hicks playing first base quite a bit in his place. Only six players have reached both 500 home runs and 3,000 hits, and with 465 homers and 2,676 hits, Cabrera still has a good chance to join that group if he can come back and play several more seasons. His pursuit of those milestones is on hold now, though. And Detroit fans can only wonder how effective he’ll be going forward. Cabrera was cheerful Monday night and quick with a laugh, but it’s clear that being out of action is tough for him.